Well, how ya doin today? Hope you had a great evening and you are so ready for a new day. We are continuing our journey through James. 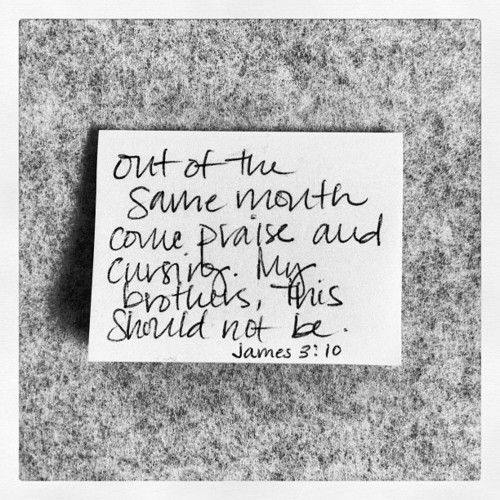 Today we are on James 3. It's a very interesting look at our words. How sharp our tongue is, like a two edged sword. Words can hurt, words can tear you down or build you up. They can make or break you. People may call you this or that and whether or not it's true, it can be hurtful. Kids and adults are bullied, names called, and hurts that can last for a lifetime if not released, forgiven for your sake not always theirs. Today, we are going to use a few different angles to look at James 3. It's a great chapter, as all of them are, but this is one that we have to really take some bites and chew on. It's only 18 powerful verses. Over half of them have to do with our tongue, words spoken and what are responsibility is to tame it. People are quick to call you names when you don't agree with them instead of looking at all sides and agreeing to disagree without name calling. We do not have to agree with everyone, we don't have to object to everything either. We can keep silent on the things that don't require a lot of energy, but stand up without name calling for the beliefs we carry close to our heart. Whether we agree with them or not. There is much I will stand my ground on, but name calling and belittling someone will not make them see my side or even respect me. Loving them where they are, sometimes even saying goodbye because you have come to an impasse that neither of you can get through, sometimes it's best. 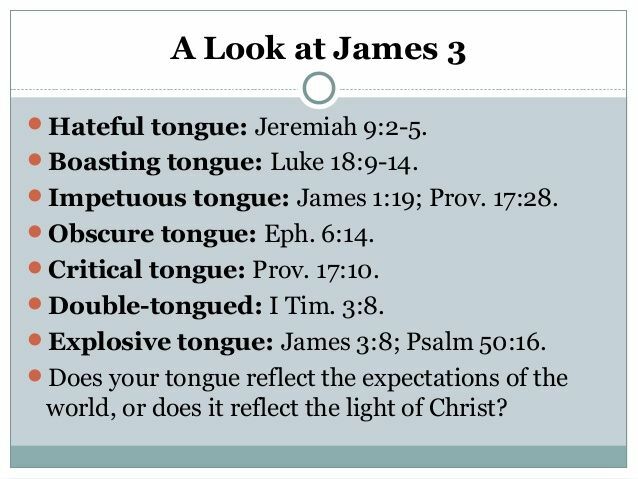 So, let's go on this Journey through James 3 and see what we find out. Take a drink of coffee/tea or soda, and let's get this van moving through. Slow down as you read this and let it soak in, each word, each phrase. Let's start with prayer... Lord Jesus, Thank you for helping our understanding, for our inner peace even when the world outside is stormy. Thank you for helping me understand your word. Open my eyes to see, my ears to hear, my soul to soak in and my mind to be alert. Let every word soak into my soul, my mind and my heart. Let every person that reads this be transformed by your words, conformed to your words, let me be faithful in your teachings and let the changes be inward and outward expressions of your love in my life. In Your Precious Name Jesus, Amen. Take my life- this is a great song about what I just prayed for us. 3 Not many [of you] should become teachers [serving in an official teaching capacity], my brothers and sisters, for you know that we [who are teachers] will [a]be judged by a higher standard [because we have assumed greater accountability and more condemnation if we teach incorrectly]. 2 For we all stumble and sin in many ways. If anyone does not stumble in what he says [never saying the wrong thing], he is a perfect man [fully developed in character, without serious flaws], able to bridle his whole body and rein in his entire nature [taming his human faults and weaknesses]. 3 Now if we put bits into the horses’ mouths to make them obey us, we guide their whole body as well. 4 And look at the ships. Even though they are so large and are driven by strong winds, they are still directed by a very small rudder wherever the impulse of the helmsman determines. 5 In the same sense, the tongue is a small part of the body, and yet it boasts of great things. See [by comparison] how great a forest is set on fire by a small spark! 6 And the tongue is [in a sense] a fire, the very world of injustice and unrighteousness; the tongue is set among our members as that which contaminates the entire body, and sets on fire the course of our life [the cycle of man’s existence], and is itself set on fire by [b]hell (Gehenna). 7 For every species of beasts and birds, of reptiles and sea creatures, is tamed and has been tamed by the human race. 8 But no one can tame the human tongue; it is a restless evil [undisciplined, unstable], full of deadly poison. 9 With it we bless our Lord and Father, and with it we curse men, who have been made in the likeness of God. 10 Out of the same mouth come both blessing and cursing. These things, my brothers, should not be this way [for we have a moral obligation to speak in a manner that reflects our fear of God and profound respect for His precepts]. 11 Does a spring send out from the same opening both [c]fresh and bitter water? 12 Can a fig tree, my brothers, produce olives, or a grapevine produce figs? Nor can salt water produce [d]fresh. Really look at this passage above. It's all about the tongue and your choice to use it for good or evil. Into Thy Word site explains it this way. " James is telling us that those who teach have a greater responsibility in communicating effectively and we will be judged in a stricter sense due to the fact we are conveying to others His precepts. 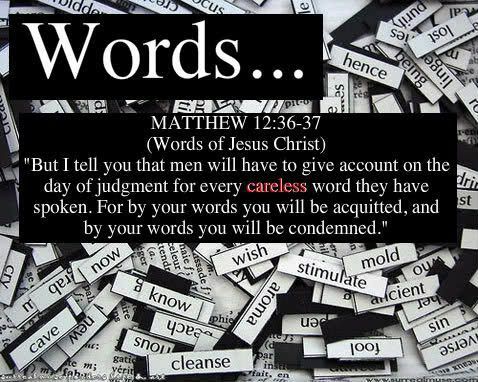 If we do it with bad intentions, or use words to put others off/down instead of lifting them up, we will be judged for it! So, how we can make sure we are better at modeling Christ to others? The key thing James brings to our attention is the discipline to exercise self control in how we use words! This is paramount, because what comes out will either lift up or destroy. The power and responsibility are ours." "So then, do you fully understand the power of our words? Our tongues are two to six ounces of muscle and whether from the biggest bodybuilder to the frailest little child, they get more exercise and less control than any other muscle in our 50 lb to 350 lb body! Thus, we must be conscious of what comes out of our mouths before it comes out. Squeezing the toothpaste out is easy, but putting it back in the tube is nearly impossible. When our words come out, they are out for good! We must have them under control! How can we do this? By making sure our tongue is under a good helmsman, God (Psalm 19:14; 51:10; 141:1-4; Eccles. 3:7; Mark 12:34; Luke 6:45; 2 Cor. 6:3-10; 10:5; 11:3; Phil. 4:8; Eph. 4:8; 1 Pet. 1:13-14), and by making sure our spiritual formation is growing in Christ as Lord. When our spiritual life is growing, we will be disciplined as our unspoken words from our thoughts, and our motivations and attitudes are aligned up to His, then our spoken words and deeds will show authentic character and maturity. Perhaps, you may think that James does not apply to you. I do not gossip or lie. But, the bottom line is to improve our relationships; thus, we have to start with how we honor and respond to our Lord and Savior! We are to respond to His precepts with our personal holiness! Because we received His grace that sanctified our heart and covered our sin, it should strike a cord within us to respond. Out of our gratitude for what He has done for us, we should be willing to strive to seek righteousness in all that we do including, and most importantly, our tongue. Our words can be the sweetness that spills unto others and be the honor and trustworthiness we earn in the hearts and minds of the people God brings into our life. Or, our words can also feverishly destroy! We must be willing and able to check our words before they leave our lips, and to think in good terms before we speak. We have to see the destruction that can come by inflicting anger and frustration, resulting in low self-esteem, loneliness, and despair. Our words can create success or they can create failure. We all have been positively motivated by someone's words uttered purposefully, or negatively, as a slip of the tongue is made as a mistake. Thus, if you like to use words as weapons, consider this; words have a boomerang affect. That means, what you throw out will come back to hit you. If you think you can duck them, well you cannot, because once you release those hurtful words, you cannot put them back any more than you can put the toothpaste back into the tube. They are out, and out for good. Having trouble? Take heart, He is the One who changes us and forms our character. All we do is adoringly respond by faith and commit to His precepts. We need to think before we speak, so we are careful not to say things that could hurt someone, or cause a fight or an argument. 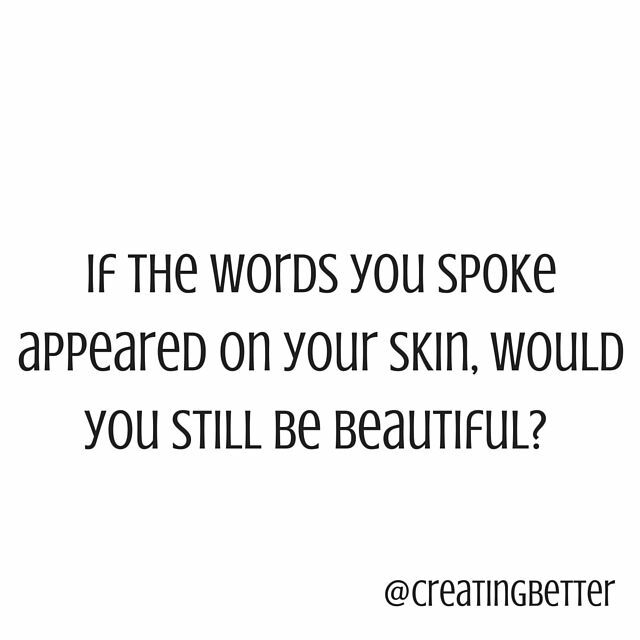 Commit to preventing your words or body language from discouraging others. This translates that we will not ever gossip or talk negatively about others at work, school, home, church, or anywhere in the universe-period-if we claim Christ as Lord! Remember, your words will reflect your true character! Your words have the power to change someone else's life for the better. If you criticize others, then you will be criticized, too. If you lie to others, then you will be lied to, also. If you gossip about others, then others will gossip about you. If you cheat others, then others will cheat you. Do you see a pattern? It is a simple pattern; what you give out, you will soon get back. We have to realize deep down in our hearts and minds how powerful our words are as they shape and form both us and others around us. Words have power to destroy people's lives, just as a spark can destroy an entire forest. The greatest gift you have is the ability to communicate; the greatest responsibility you have is using your ability to communicate with character and distinction within the parameters of God's call to you!" When I looked up the word "Words", I came in with this... Proverbs 16:24 Pleasant words are like a honeycomb, Sweet and delightful to the soul and healing to the body. Like silver refined in an earthen furnace, purified seven times. You will protect him from this [evil] generation forever. As vileness is exalted and baseness is prized among the sons of men. So, we see that through the Word, we can learn how the words and tongue that speaks the words can be used for good or evil. As we reread this, what changes can you make in your own life to ensure that your tongue is tamed and your words build up and not tear down? Is it easy for you to spew words of unkindness or is it easy for you to tame it? Look at these scriptures, you will find even more answers. 13 Who among you is wise and intelligent? Let him by his good conduct show his [good] deeds with the gentleness and humility of true wisdom. 14 But if you have bitter jealousy and selfish ambition in your hearts, do not be arrogant, and [as a result] be in defiance of the truth. 15 This [superficial] wisdom is not that which comes down from above, but is earthly (secular), natural (unspiritual), even demonic. 16 For where jealousy and selfish ambition exist, there is disorder [unrest, rebellion] and every evil thing and morally degrading practice. 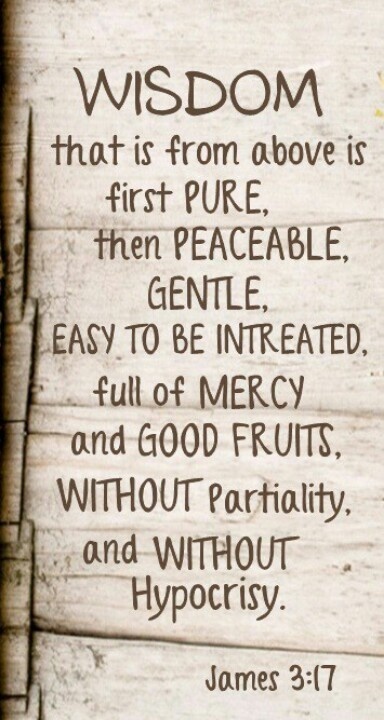 17 But the wisdom from above is first pure [morally and spiritually undefiled], then peace-loving [courteous, considerate], gentle, reasonable [and willing to listen], full of compassion and good fruits. It is unwavering, without [self-righteous] hypocrisy [and self-serving guile]. 18 And the seed whose fruit is righteousness (spiritual maturity) is sown in peace by those who make peace [by actively encouraging goodwill between individuals]. What did you see here? Let's let Into They Word explain it better than I can right now. "Arrogance and condescending attitudes and actions are heinous acts that are diametrically opposed to all that Christ taught and modeled. To be a Christian who is condescending is an oxymoron, with the emphases on the moron. It is stupid and a slap in the face of our Lord who saves and loves us! At the same time, real wisdom will not be compromised, as integrity and compassion do go together. God calls us to be wise stewards of not only material things but of what is even more important, wisdom. Wisdom for the Christian desiring to live for Christ and not in the world is to be living a life patterned off our Lord. Jesus Christ both fully God and fully man was also wise beyond our comprehension, yet He tempered His wisdom and dispensed it ever so gently on others. He showed the Truth while exercising love and care. If we live a passion directed life, this is good, but is the passion under check and control or have the reins become unbridled and on the ground dragging. If so, love and gentleness is not coming from you while the house of your will is in full spirit and wild. We are called to be under control and not wild in our thinking, temperament, actions and our words. At the same time, we are to be passionate and this is essential on how we dispense wisdom (Matt. 7:15-23; Col. 3:10). This all translates in how we are to others for Christ. We are to be exercising purity, righteousness with gentleness and respect while being responsible and unwavering with His percepts, so no hypocrisy can come from us. This creates an atmosphere of peace where His wisdom is sought and exercised. When we are learning and proclaiming God's wisdom, we will live this life with passion and conviction. We will see life as a wondrous adventure staying in His presence and precepts. So, ask for His wisdom and then live it for His glory! Seize the fantastic opportunities He has for you! Understanding His grace will help empower us to be honest with wisdom, seek His percepts and not that which is false. The grace we receive if it has taken root within us will display humbleness; as we are exalted in Christ, we have no need to have inflated egos. Our significance is in Him, thus we are upgraded in Him beyond any human hopes or dreams (Deut 4:6; 1 Kings 3:9; Psalm 119:97-98; Matthew 6:33; Romans 12:3; 1 Timothy 1:18-20). This is from www.intothyword.com , they have an amazing study. I like this chapter because, over the years, many have told me what they think, believe, or called me names like bigot, hypocrite, racist, just to name a few. These are words that hurt, yet make me really look into the mirror and see if that reflection is coming out. It doesn't. I have never been any of those and those words are hurtful. Many times it has been because I don't simply agree with them and I will stand on the Word of God most of the time to defend what I believe or I have really looked at the whole picture (realist). Sometimes, I am quick to hurry a reply back and need to remember to be slow to anger. Sometimes, it is just too much and having to say goodbye because the hurtful words have been too much to bear and I just can't get past it, that isn't always the best way to handle it, but it is where I have to run into my safety zone so I can get healed up and go again. How many times has someone said something to you and it affected you so hard? 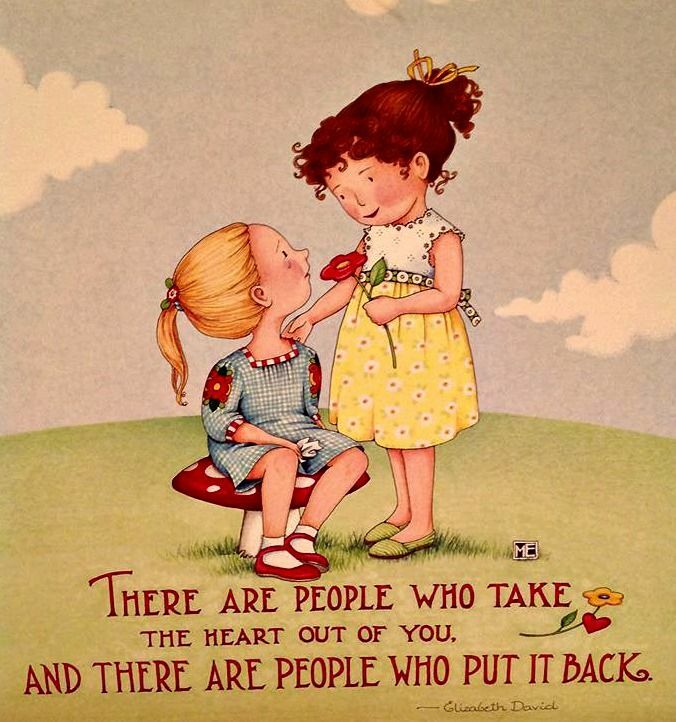 Or have you been the one that has been hurtful? What in both cases could or can you do differently after really reading this passage and taking it to heart, can you change. I get called "really sensitive" and I am. I am not afraid to admit it. I do not like to fail myself or others and those names and more hurt. I really have to look at see if that is really me. Those self reflections have helped. I love who God made me to be. I am ever changing and loving it more and more. How can you allow the Lord to change your heart, mind, and soul with the last 3 chapters of James? How can you put it into practice? 1. Have you ever measured something wrong and wasted your wood or material? How did you feel? How is this like living the Christian life? 2. What is jealously? Have you struggled with jealousy? How so? What causes it? How can you know when your emotions get out of control with envy? 3. What is arrogance? Have you struggled with arrogance? How so? What causes it? How can you know when your emotions get out of control with being condescending? 4. How would you describe the distinction between the world's wisdom and the wisdom of God? 5. How would you describe a peacemaker? How have you seen this work? Have you been one? How can you be one? 6. Read 1 Peter 5:1-4: How do Peter's principles compare to James? How would they improve your relationships? Improve your church? How can you live them out? 7. How do integrity and compassion go together? How would you contrast humility and wisdom to foolishness and arrogance? Why is it, that to be a Christian who is condescending is an oxymoron? 8. How can you go from being just a fruit inspector to a fruit giver? 9. When we are learning and proclaiming God's wisdom, we will live this life with passion and conviction tempered with truth. How so? Why do some Christians refuse to do this? 10. How would you honestly assess what your motives are for the wisdom that you are proclaiming? 11. God calls us to be wise stewards of not only material things but of what is even more important, wisdom. What would your life and church look like with this precept in action? 12. What can you do to gain a better understanding of His grace, so you can be empowered to be honest with wisdom and seek His percepts and not that which is false?